Page Street Publishing, 9781624146411, 464pp. Seven standout authors have joined forces to create this definitive vegan reference book. With more than 600 recipes, this indispensible kitchen staple is perfect for seasoned vegans looking to build their repertoires, cooks new to the basics of plant-based cuisine and curious meat-eaters on the hunt for new flavors. Gluten-free, soy-free and sugar-free options are included, and many recipes come together in 30 minutes or less. Offering unbeatable variety and covering everything from main dishes, sides, soups and salads to breakfasts, beverages, desserts and pantry staples, these experienced and creative vegan authorities have you covered. 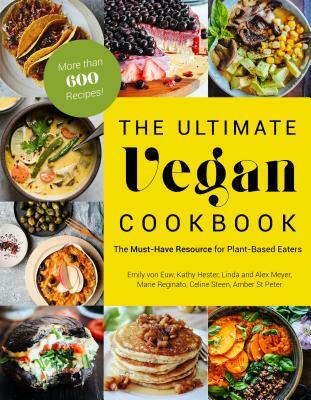 Emily von Euw, Kathy Hester, Linda and Alex Meyer, Marie Reginato, Celine Steen and Amber St. Peter are bestselling authors of healthy and delicious plant-based cookbooks. Their work has been featured not only on their own enthusiastically followed blogs but also in numerous magazine and newspaper articles, on food and health blogs, on restaurant menus and on websites such as PETA and BuzzFeed. They live across the U.S. and Canada.